I purchased a 4-pack of this sauce while shopping at Costco. Read to find out if it was worth my money. 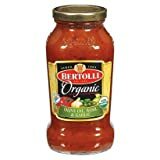 Product Description: Jarred organic pasta sauce from the Bertolli brand, advertising olive oil, basil and garlic ingredients. I purchased four jars of this pasta sauce about a week ago for $8.99 while shopping at Costco. I have used this sauce on a couple different occasions since that time, usually with a pasta dinner. My wife, daughter and I were in the general area about a week ago, running other errands so, before heading home, decided to stop at Costco to pick up a few items we needed. As is usually the case, we ended up filling our cart with some of the bargain-priced items we came across. This included the Bertolli Organic Olive Oil, Basil & Garlic pasta sauce. I purchased this product mostly because of the price. We go through a lot of pasta sauce in our house and I thought $8.99 for four jars was a decent enough deal to justify the purchase. However, I had never tried this product before and, because of that, wasn't really sure what to expect from it. As it turns out, after trying the pasta sauce shortly after purchasing it, my opinion of it is a bit mixed. One positive thing I noticed about this sauce after opening the jar was how thick it was. It didn't have some of the "chunks" other sauces have. But, I've purchased quite a few bargain-priced pasta sauces that weren't much thicker than tomato-colored water. And, I did appreciate the thickness of this brand because it did give the sauce a little more versatility. If I wanted to add hamburger, meatballs or mushrooms to the sauce, I was able to do so and have the sauce stick nicely to those additions. In comparison, I've had plenty of other sauces that just let those types of things easily settle to the bottom and not seem very appetizing as a result. Of course, the fact I could do this with only one jar (rather than having to open a second one) was also a nice plus. When it came to taste, however, I did find the sauce was lacking something. To be fair, it wasn't the worst-tasting pasta sauce I've ever purchased. But, it did seem kind of bland compared to most. At minimum, I think it could have used a little more garlic because the flavor seemed to improve considerably when I "doctored it up" by adding my own to it. This part was, admittedly, a little bit of a disappointment because, with the unexpected thickness, I really was expecting a flavor that would complement the sauce's texture. It's an OK sauce that I probably would purchase again if I were to find it on sale. However, if I did make that purchase, it would be with the expectation I would have to add something to it to make it as tasty as I prefer. A review of the pre-packaged pasta side dish I purchased a couple days ago. I purchased a can of this sauce while shopping last night. What did I think of it?